April Adames and Eva Ulrich did it. Athena Buensuceso did too. 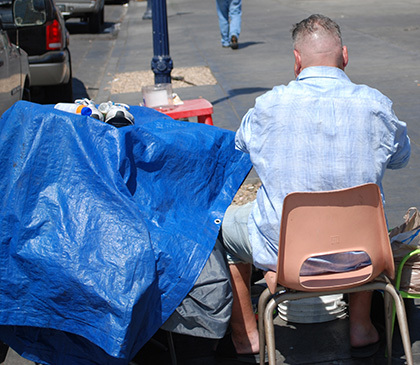 They helped to count homeless people in San Diego last year. And they’re planning to do it this year too. Will you join them and the hundreds of other County employees who have already signed up? The annual count of homeless people in San Diego County will take place Friday, Jan. 26. from 3:45 a.m. to 7 a.m. The deadline to register is Jan. 19. The Point in Time count is part of the WeALLCount campaign. The results are used to apply for federal funding that is used to help local homeless people and find solutions on how to best serve those most vulnerable in our community. The Board strongly believes in this worthy cause and has agreed to offer paid time for County employees who choose to volunteer and assist in the effort. All it requires is three hours of your time and a short training. Volunteers have the opportunity to count our homeless population and can request the areas to visit. They could go out in teams of two or three with other County employees and volunteers. Ulrich, a housing specialist with Housing and Community Development Services, said she has participated in the count for the past three years and also found the experience a positive one. Last year, there were 9,116 homeless men, women and children in the San Diego region. More than 500 County employees participated in the count and an even higher number is sought this time around. “It was both a duty and a privilege to join a thousand-strong San Diego counters who collectively demonstrated that every single person counts,” said Buensuceso, an information technology specialist with the Air Pollution Control District. Volunteers will work in teams in specific locations and simply tally how many homeless people they see. If you are interested in participating, review the registration guidelines and FAQs and then obtain approval from your supervisor via the supervisor approval form. nce completed, you can register for the WeALLCount campaign on the Task Force’s website.